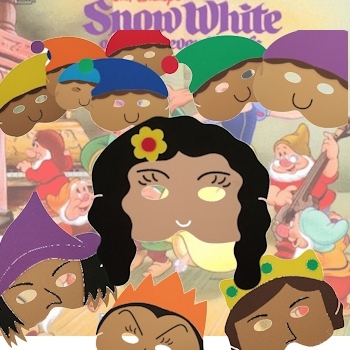 Fun Gift Set storytelling masks of classic Fairy Tale Snow White and the Seven Dwarfs that children will love to act out. These masks are a favourite with children, child-minders and teachers aiding imaginitive play and storytelling. This 11 piece Fairy Tale Mask Set Snow White and the Seven Dwarfs includes: Snow White, Seven Dwarfs, Evil Queen, Prince, Hunstman.